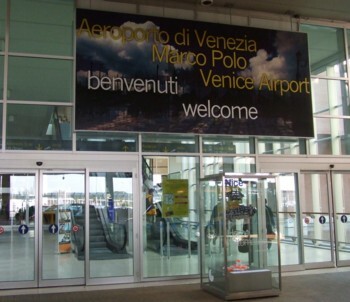 Marco Polo Airport is Venice's official airport, and is just a few miles from the city. International flights to Venice usually land at Marco Polo Airport, 8 miles from Venice (Aeroporto di Venezia Marco Polo; IATA code VCE). Easyjet operate budget flights to the airport from the UK, and British Airways also fly there, with prices which can sometimes compete with the low-cost airlines. Ryanair fly to Treviso Airport, further away. Flight time from London is around an hour and forty minutes. The airport is modern, busy and fairly efficient. Transport into Venice is straightforward, although services stop at night. You should think about your travel plans in advance, as travel within Venice can be time-consuming, and the location of your hotel will determine your best route from the airport. A water taxi is by far the most romantic and glamorous way to arrive in Venice - especially if your hotel is one of the grander ones and has a water entrance. Unsurprisingly, this is a very expensive option, likely to cost from €110. There is a desk at the airport run by the Consorzio Motoscafi Venezia where you can organise a water taxi. A cheaper way to arrive in Venice by boat is to take a public ferry. A ferry service called Alilaguna runs waterbuses (motoscafi) across the lagoon to a number of the major ferry stops in Venice, including San Marco (for the St. Mark's area), Zattere and Arsenale as well as the Lido and Murano. Check with your hotel to make sure you get off at the nearest stop to your accommodation: it's very tiring to drag cases around Venice's alleys and over bridges. If your hotel is in an outlying location, such as the Lido, an Alilaguna ferry may be your most efficient means of transport. Alilaguna run several different routes, distinguished by colour, so make sure you catch the best one for your destination. A one-way ticket costs €15 and a return is €25 (see our transport page for more information on travel once you get to Venice). It takes several minutes to walk (following the signs) to the ferry stops on the lagoon shore. Tickets for the ferries can be bought at desks in the arrivals hall and also by the jetty. The cheapest transport from the airport into Venice is by bus, and there are two options which link Marco Polo Airport with Piazzale Roma (this is as far into Venice as you can get with land transport). Piazzale Roma is in the corner of Venice alongside the lagoon's road-bridge. Unless you are staying nearby, you will then need to use Venice's public boat services to continue your journey - this is why the Alilaguna ferry from the airport is often a quicker option. Buses depart from a row of stops opposite the exits to the airport building; there are electronic departures boards. An express coach service is run by a company called ATVO - the line is number 35, but it's clearly labelled for Venice (Venezia). It runs directly to Piazzale Roma, takes 20 minutes, and costs €5. Details and timetables for the buses are available on the airport and ATVO websites (see links panel on the right). They run approximately every half-hour, and the last departure from the airport is at 12:20am. A local urban bus service, the number 5, also links the airport with Piazzale Roma. This is run by ACTV, is usually a low-slung orange or blue bus, and is the cheapest option, costing €2.50. It stops en route, but is still reasonably quick, with a scheduled journey time of 25 minutes (traffic permitting). The 5 leaves the airport every half-hour until 11.10, after which there are services at 12.10am and 1.10am. You should buy bus tickets before you get on the vehicle - tickets for all the airport bus services are available from ticket kiosks inside the terminal building. There are also ticket machines by the stops, although I wouldn't rely on them working. Stamp them in the machine provided when you board the bus. It is also possible to take an ordinary taxi from the airport, but of course they can only take you as far as Piazzale Roma, after which you'll need to take a boat or continue your journey on foot through Venice. If your flight into Venice is delayed until after public transport has ceased for the night (around 1am) then your best option is to share a taxi with other passengers to Piazzale Roma. Expect to pay around €30. Within Venice a vaporetto (waterbus) service runs all night, although with reduced frequency and stops. 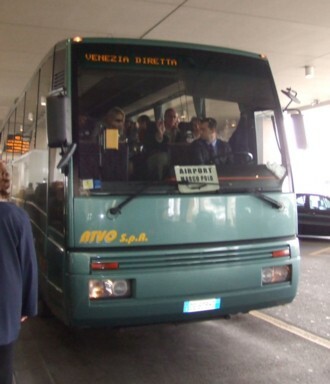 A direct ATVO service, the 'Fly Bus', connects the airport with the railway station at Mestre, the mainland part of Venice - useful if you are staying on the mainland or heading off to another part of Italy. This is a major station on Italy's railway network, with trains heading to many useful destinations. A local ACTV bus, the number 15, makes the same journey, taking a few minutes longer. If you are heading for Padua you can either travel to Mestre and onwards by train, or take the SITA bus service from the airport, departing every hour (every 30 minutes at peak times) and taking an hour and ten minutes. A seasonal bus service run by ATVO also heads up to the Alps. This runs from Venice to Cortina d'Ampezzo in the Dolomites - Venice Airport is not a scheduled stop but can be requested in advance. Seasonal ATVO services also link the airport with a variety of local seaside resorts such as Lido di Jesolo and Caorle. The airport is quite spacious and modern, with a range of shops and eating places. After security there is the usual range of duty-free shopping, with a good choice of shops for travellers looking for an expensive scarf, watch or similar gifts. There is even the chance to buy pricey Murano glassware without cramming it into your regulation hand-luggage. You can find a hot meal either airside or landside. Before security there is a self-service cafe-restaurant, and another can be found upstairs after you've passed through security. Unfortunately these businesses don't keep such long hours as the airport, so if you have a morning or a late evening flight you might not find much open. The bar in the main departures area (after security) closes around 11pm, and serves hot, cold and alcoholic drinks as well as heated rolls and other light snacks. This is where you come if you have delayed-flight food vouchers. Upstairs there is a panoramic gallery with lagoon views; you'll find more shops upstairs, a bar selling snacks and pizza slices, and also the good, cheap self-service restaurant which serves pasta. I've found the airport to be fairly efficient - my one long delay here was due to fog in London, rather than any local problem. This is the most local airport for Venice, and it is more convenient than Treviso, though it has in the past been more prone to strikes by workers. I've also been suprised at the length of time it can take to travel to Venice by bus. Although the journey is usually 20 minutes, there is just one road between Venice and the airport so traffic problems can be critical; I spent an hour on the short journey one afternoon and wished I'd taken the boat instead (no traffic jams!). Try to get a window seat on the right-hand side of the plane when you're flying to Venice (BA's online check-in is very helpful). Usually the route before landing loops northwards and comes in to land over the lagoon - you can see the bizarre water/landscape of the southern lagoon, then Venice itself from a low height, then the northern islands. The airport is on the shore of the lagoon, level with the islands of Burano (recognisable by its leaning belltower) and Torcello (it's easy to spot the imposing, isolated cathedral). Staring down from the windows of the plane makes a great introduction to Venice. 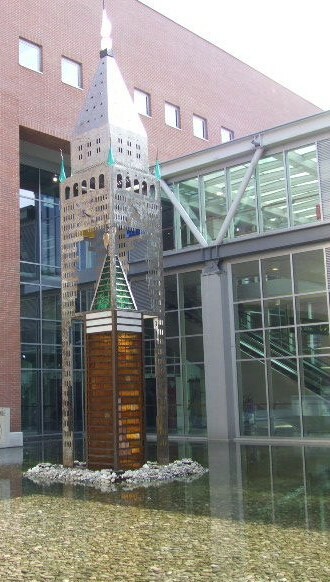 You can really appreciate the city's unique geography, its watery surroundings and the surprising smallness of the city itself. The Marco Polo lounge is upstairs from the main departures area, after security. It's open to various types of traveller including holders of the Priority Pass. The lounge is furnished with comfortable armchairs, tables and computer stations. It's considerably smarter than the rest of the airport, with rugs on the wooden floor and great views over the lagoon towards Torcello. There's a terrace outdoors for admiring the views and the aeroplanes. A selection of snacks and drinks are offered free, including croissants, cold pizza squares, small sandwiches, wine and soft drinks. There are newspapers to read. Wireless internet isn't free. You can see the same lagoon views, though less close-up, in the main departures area, which rarely gets hectic or overcrowded, so generally I wouldn't say that the lounge is a necessary expense, but it is a more comfortable way to start your journey.